We bought Pinta from the Daisy Hill Puppy Farm last December. 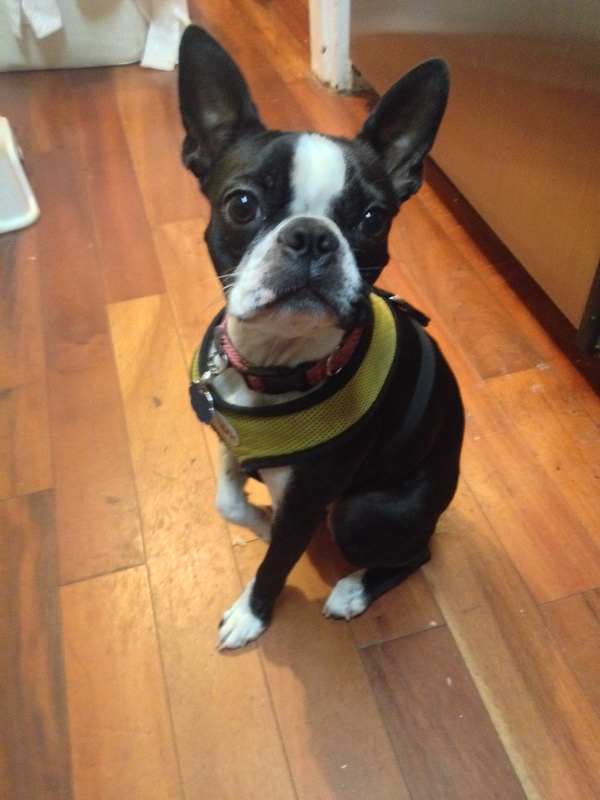 Just kidding–it was Howling Hill Kennel, a local breeder of small small breed dogs (Bostons and Pugs). I appreciated the advice regarding rescue dogs from NoVA and, I think Goose. Sadly, the local links ranged as far as N. Carolina and so there were very few Bostons available in this area. Pinta means painted or spotted in Spanish. 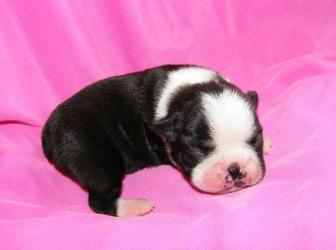 The name fit for a Boston Terrier. She’s actually named for a rice and beans dish from Central America called Gallo Pinto (spotted rooster). As ours is a female, the appropriate name was Pinta. All we need to do is pick up a boy, who will of course be called Gallo. Well, that or Bilbo. I figure hobbit names work well for small dogs. What to do? I didn’t want to buy a bunch of expensive dog food and it struck me that it’s something one could make. I hit the web and looked through a few recipes. This was going to be a supplement to her main diet, so I wasn’t worried about making a complete food. Just something that would be a bit of a treat when I left in the morning, but one that is nutritionally appropriate. It takes a couple of hours to make, but there’s not much active work and one batch makes enough to last for a couple of months. The essentials are meat, rice, and veggies. I went with chicken for the meat. Chicken quarters are inexpensive and the bones are useful for making stock. I suppose I could break down whole chickens and save the breast meat for human food. I got mixed messages regarding rice. Brown rice is good, because it has additional nutrients. No no no. Brown is bad, because it’s harder to digest. I split the difference in the end. I used a sweet brown rice (the bag your own bin at Whole Foods), but I cook it an extra step. I’m a fan of risotto, so I thought that might work. I cook the rice in our rice cooker and then cook it further with chicken stock so that it gets a risotto like texture. For veggies, I use carrots and peas. 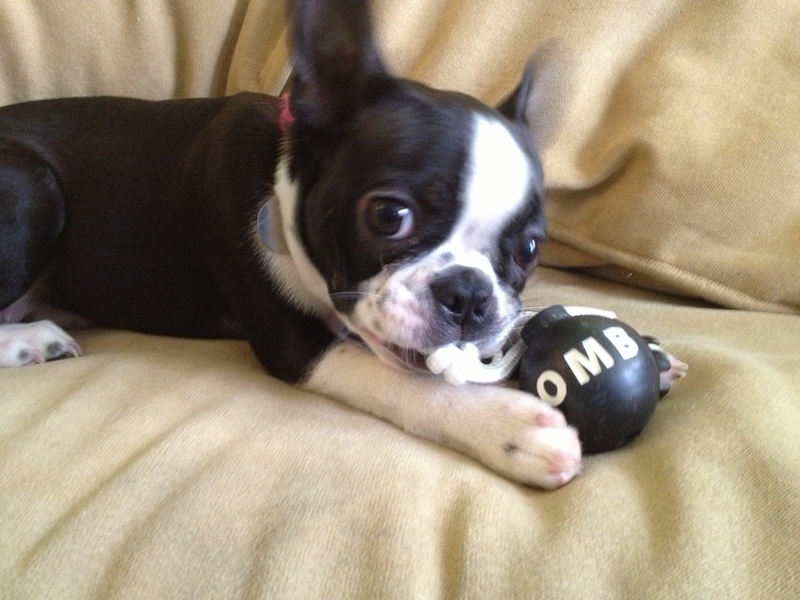 Onions are verboten as they can be toxic to dogs. I don’t use a commercial stock as onions are certain to be used and I’d rather not deal with doggie indigestion.Although this isn’t our dog’s primary food, I add a vitamin supplement and some Omega 3 oil. Once everything is mixed together, I freeze it in one cup portions. I can transfer one down to the fridge in the evening and it’ll be defrosted by morning. On days when she’s alone, I give Pinta about 1/3 cup when I leave in the morning and a similar amount in the evening. The basic approach works pretty well with other proteins. I was cooking salmon recently and had some trimmings after I made filets. That made a nice small batch of Pinta food. Likewise, I had a chuck roast that I used for a Trieste goulash. Grind the smaller pieces and use them for a beef based version of this dish. 1. Cook rice. I put rice and three cups of water in a rice cooker and let the machine do the work. 2. Remove skin from chicken quarters and separate meat from bone. Make stock from the bones, ~6 cups of water, several stalks of celery and a couple of carrots. Do not use onions as these are slightly toxic to dogs. Bring up to a boil and simmer, uncovered, for about an hour. You should get about four cups of stock. Strain and return to pot. 3. Use a meat grinder or food processor to make ground chicken. If using a food processor, cut the chicken into large pieces (1” – 2”) and put in freezer for 15 minutes. This is a method I use for ground beef (taken from Cooks Illustrated). 4. Add a bit of oil to a large, heavy bottomed pot and heat slightly. Add the ground chicken and cook, stirring occasionally, for a few minutes. No need to cook it completely, just take an edge off the rawness. Add the carrots and peas, stir and add a couple cups of hot broth. It’s not a bad idea to defrost the peas in the microwave and chop in the food processor. 5. When the rice is done, add to the pot with the remaining two cups of broth. Simmer until the broth is absorbed. You’re going for a risotto like consistency. I read conflicting information about digesting brown rice, so decided to break it down further. Whole Foods has sweet brown rice, which is short grain and hence suitable for this kind of dish. 6. Add the softened rice to the chicken and vegetables and stir. Cook uncovered until the broth is mostly absorbed. Stir in nutritional supplement. These vary quite a bit, so use your judgement as to the right amount. I use a combination of a NutriVet and Omega 3 oils. This makes about four quarts of dog food. I freeze in one cup quantities. Move to the refrigerator the day before and it defrosts nicely. I reheat to room temperature in the microwave before serving. I’m still catching up from last week’s news and propaganda but I did read a couple of pieces that I thought were pretty interesting. This was from the AP Friday. MILWAUKEE (AP) — Abortion is still legal but getting one in many states will be difficult if laws passed this year are upheld by the courts. In a march through conservative legislatures, anti-abortion Republicans passed a wave of new restrictions that would sharply limit when a woman could terminate a pregnancy and where she could go to do so. The push brought the anti-abortion movement closer to a key milestone, in which the procedure would become largely inaccessible in the three-fifths of the country controlled by Republicans even if still technically legal under Roe vs. Wade. But rather than continuing to roll across the GOP heartland in synch with the pro-life movement’s plan, the effort may now be hitting a wall. The obstacle comes not from opposing Democrats but from GOP leaders who believe pressing further is a mistake for a party trying to soften its harder edges after election losses last year. The resisting Republicans include governors and top legislators in more than a half-dozen states, including some of the largest and most politically competitive in the party’s 30-state coalition. They are digging in to stop the barrage of abortion proposals, hoping to better cultivate voters not enamored with the GOP’s social agenda. This one’s a little long but a fascinating read on our 40 year war against marijuana. I don’t indulge but it’s pretty clear, I think, that it’s time to change our policies. I loved this Nixon quote. I’m pretty sure this isn’t going anywhere but it’s the thing I’ve been talking about since 2009…………..jeeze. Medicare for all. Here’s the money quote that makes it dead on arrival. And since we have peppers coming out of our ears (garden) here I thought I’d post my Baked Jalapeno Poppers recipe. I use a combination of whatever peppers we have in the garden. I can usually get about 15 to 18 poppers from this recipe. Slice peppers in half lengthwise and remove seeds and membrane. I like to leave part of the stem on. Stuff peppers with cheese mixture. Seasoning: salt, pepper, paprika, garlic powder, onion powder, cayenne pepper and Mexican oregano to taste. I just wing it and add to both flour and bread crumbs. I learned something this week; Brent enjoys the Bites & Pieces posts. Well, in that case here we go. Oooops, he and I don’t have much in common except that he’s a Democrat when it comes to social issues, and I’m pretty sure our food tastes will be as out of sync as our belief in the free market. I’ve described myself as a grazer and I wasn’t kidding. I offered up my kale and pine nut salad and he didn’t jump at the offer so I think I’ll offer up my prime rib, Yorkshire pudding and spinach soufflé instead. I’d throw in my blueberry cheese cake but he’d probably have a heart attack and you guys would blame me for the loss of our Morning Report. I only serve this meal once a year……… maybe, and I generally make a big salad to go with it so I can keep from starving to death while I watch everyone else inhale their dinner. Minimum 3 rib standing roast of quality, we buy prime. The weight doesn’t matter and I’ve actually purchased a roast of only 2 ribs before and the recipe works. You can have the butcher cut the bones away and reattach with string if you want. Generously season the entire surface of roast. We like a Monterey seasoning but you can use anything you want as long as it includes some salt. Be creative. Bring roast to room temperature and pre-heat oven to 375. Place roast in roasting pan with a rack under it. Put roast in oven, uncovered, and roast for 1 hour. Turn oven off. Leave roast in oven, with door closed until guests arrive or about 45 minutes before you want to serve dinner. Do Not Open Oven Door and the roast must be in the oven for at least 2 hours after first roasting before you turn the oven on to finish. It can stay in longer though. Turn oven on to 375 and continue roasting; 35 minutes for rare, 45 minutes for medium or 55 minutes for well done. I leave it in for 45 minutes and the outside pieces are medium and inside is medium rare. Everyone around here says that’s perfect. Serve with creamed horse radish sauce. I used packaged au jus mix or brown/onion gravy for the meat and the Yorkshire pudding. There won’t be enough drippings in the pan to make au jus or gravy generally. Mix milk, flour, eggs and salt until well blended. Refrigerate for at least two hours. Spray muffin pan with Pam and put ¼ tsp of Crisco into each muffin tin. Place pan in oven and heat in oven at 400 until Crisco is melted and quite hot. Ladle cold liquid evenly between 12 muffins, quickly while pan is hot. Bake at 400 for about 25-30 minutes until the Yorkshire is puffed up and brown. Let muffins sit in the pan for about 5 minutes before removing as it’s easier to get them out. Don’t skip the Crisco or spraying the pan. They will fall as they cool but that’s normal. There will still be little hollow places inside. Combine all ingredients in a round and deep baking dish and bake for one hour at 350. If you only have one oven (I actually have two) you can cook the spinach with the roast at 375 for a little less time. While the roast and spinach sit put the Yorkshire in. Brussels sprouts have a well-deserved reputation amongst children for being one of the nastier things they’re forced to choke down. They manage to combine insipid flavor with a mealy texture. You can imagine my surprise when my wife came back from a trip gushing over these amazing Brussels sprouts she’d had. She went to a place in Kansas City called PizzaBella. 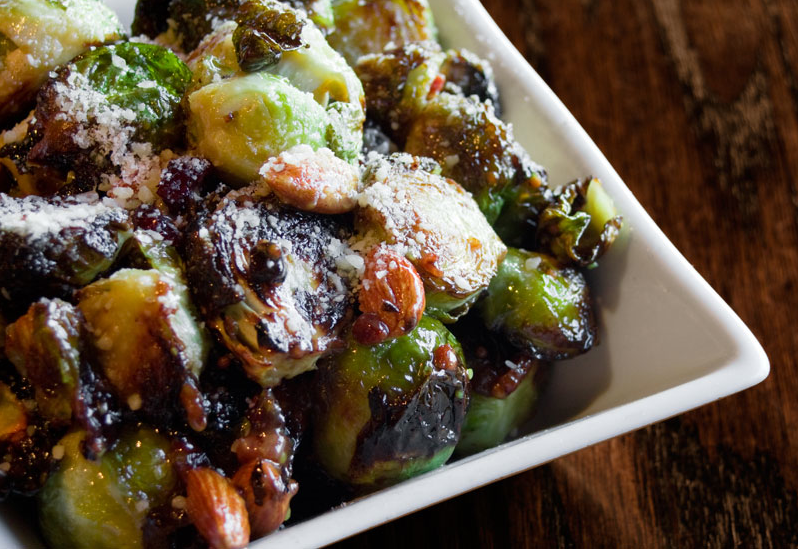 They roast Brussels sprouts with pancetta, cranberries, almonds, and vinaigrette. Looks a lot more appetizing than cream of Brussels sprouts, no? Brussels sprouts have been a fixture in our household ever since. You can find plenty of recipes out there for roasted Brussels sprouts. Here’s an example from the good folks at Epicurious (originally published in Gourmet magazine). Combine everything and spread in a single layer in a baking pan. Roast in 450 degree oven, stirring after about ten minutes, until sprouts are browned on the edges and tender. Add a bit of water to the pan when done to get the brown bits . Serve warm. Not bad. One could add the cranberries and almonds and get reasonably close to that served up by PizzaBella. I find a bit of sweetness works well in this sort of dish, so some pomegranate juice adds a nice touch. Still, one isn’t going to approach what you get from a good pizza oven at home. I wanted proper caramelization and wasn’t going to get that from the oven alone. Enter my cast iron pan. If I want a good steak, I sear it on both sides and put it in the oven until it’s medium rare. [If I want a great steak, I’ll put it in a low temperature oven until medium rare and then sear it.] So, I sear the cut sides of the Brussels sprouts, toss in the other goodies, and then finish in the oven. It’s a pain to halve and place the Brussels sprouts, but the center gets pretty mealy by the time whole sprouts are cooked. Heat the oven to 400 degrees. Put a case iron skillet over med-high heat and add olive oil. When the olive oil is shimmering (not smoking), add the Brussels sprouts, cut side down. Cook until they develop a good brown crust, several minutes. Add the cranberries and almonds (if using) and use a metal spatula to get the Brussels sprouts off the pan and mix briefly. Pour in the pomegranate juice and put into the oven until the sprouts are just cooked through. Serve with a bit of grated Parmesan cheese. Some variation on this has been my go to dish until recently, when I started playing with unusual ingredients for different cuisines. I tried my braised squid concept, using an Indian recipe for chicken with tomatoes, yogurt, ginger, garlic and the usual spices. We had a big bag of Brussels sprouts in the kitchen and I decided to try cooking them with an Indian flare. And so here we have it. Heat the oven to 400 degrees. Put a cast iron skillet over med high heat. Add the ghee until shimmering. Add the onions and cook until browned. Add the ginger, garlic and spices and cook until the fat begins to separate. You might need to add a bit of water, a technique known as bhunao. 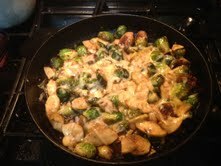 Place the Brussels sprouts, cut side down, and cook for several minutes. Scrape the Brussels sprouts from the bottom of the pan with a metal spatula and toss slightly. Put the pan in the oven and cook until the sprouts are tender, about ten minutes. I’ll post a separate B&P update for the curried squid with coconut/saffron rice. Since starting this post, I tried a third variation. The first two are good, but go into the category of anything tastes good if you add enough butter. I wanted to make sprouts that might be a bit healthier. Well, that and I was out of butter. But I did have cheese! I also had some leftover sliced and spiced apples from an apple pie that I’d made. As a slice of cheddar cheese is a classic topping for apple pie, I had my inspiration. Peel and slice the apple, then toss with sugar and spices. Set aside. Heat the oven to 400 degrees. Put a case iron skillet over med-high heat and add vegetable oil. 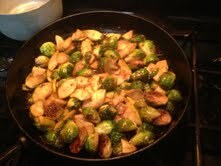 When the oil is shimmering, add the Brussels sprouts, cut side down. Cook until they develop a good brown crust, several minutes. Add the sliced apples and use a metal spatula to toss everything together. Put into the oven for ten minutes. Optional: After five minutes, sprinkle shredded cheese over the sprouts and apples and return pan to oven for another five minutes. Note: use whatever combination of spices you prefer for apple pie. I actually used some leftover sliced apples from an apple pie. I had tossed the apples with lime juice to prevent them from darkening until I assembled the pie. You can also toss in some minced ginger and garlic if you like. Squid has a lot going for it. The species grows rapidly and so is considered sustainable. It’s high in protein and low in fat. Well, at least until you bread it, deep fry it, and serve it with marinara sauce. As bar food goes, it’s a favorite of mine. The Carlyle in Shirlington has a particularly good version. My mother always has it when visiting town. One of the most interesting squid dishes I had was at the Green Street Grill in Cambridge, MA. It was made Provencal style with garlic and tomatoes. It was an eye opener and one of my favorite ways to make squid. I wanted to do something different with the squid I bought at my favorite waterfront fish monger on Friday (Captain White’s). Squid can be tricky to cook as if you cook it for more than a minute or two, you may as well serve up a plate of rubber bands. There are various strategies to tenderize it, but it comes down to a fast cook. Turns out that squid shares a characteristics with some of my favorite cuts of beef. You can cook it fast, but you can also cook it slow. In the case of beef, the collagen gradually breaks down and a tough cut of meat becomes melt in your mouth tender. That didn’t happen with the squid, but it was tender and the recipe is easy enough for a weeknight meal. I slightly adapted a recipe originally published in Gourmet, which can be found on the Epicurious web site.. NPR also has a story on slow cooked squid with some recipes that I plan to investigate in the near future. The dish has a flavor I’ve never gotten out of squid before. I love linguini with clams or mussels for the flavor one gets out of the shellfish, but don’t really care for the meat. We served the dish over black rice. It’d be good with linguini as well. I think that one could add fennel or another root vegetable to the dish. I adapted the Epicurious recipe slightly. The original recipe calls for cooking just the garlic and parsley, then adding the squid. I decided to cook some chopped onions with the parsley and then add the garlic. I used a can of chopped tomatoes; they suggested using whole tomatoes and chopping them. The original recipe calls for adding ¾ of a cup of wine and ¼ cup of water after adding the squid and simmering for 10 minutes to reduce the liquid. Then, add the tomatoes and simmer on the stove top for 45 minutes, stirring occasionally. I wanted to make this a simple dish, so I added the wine and tomatoes together, brought it up to a simmer, and then braised the dish in the oven. I had two half pound squid bodies rather than the pound and a half, but it was plenty for us. I cut them up into half inch squares, then rinsed, dried and coated them with olive oil. I thought that would give me more even cooking at the onset. They were about a quarter inch thick, so made good meaty bites. This would work well with smaller squid and I would encourage you to use the tentacles. Octopus might be good in this dish as well. Cut the squid bodies into pieces or rings. Combine with tentacles if you have them. Rinse and dry, then toss with olive oil to coat. Once the squid is ready, it’s a good time to turn on the oven. I set mine at 350 degrees, but would probably use a lower temperature (perhaps 300) the next time. Reserve 2 tablespoon of chopped parsley for garnish (which I forgot to use). Heat about 2 tablespoons of olive oil in a heavy pot or dutch oven. Add the chopped onion and parsley and stir for a minute. Add garlic and stir for another minute. Create a small open space, pour in a little olive oil, and add the red chile flakes. Mix everything together and add the squid. Cook for a minute or two and then add the wine and tomatoes. Bring to a simmer over medium heat and then throw into the oven, uncovered. Cook until the water evaporates, about 45 minutes to an hour. Remove from the oven and serve over pasta or rice. Garnish with parsley. It’s been awhile since we’ve had a bites and pieces post, so I thought I’d offer up our annual party for making tamales. The singular is tamal, but even my Costa Rica born wife calls it a tamale. I think I’ve corrupted her. Tamales are traditionally made in Latin America over Christmas. There’s a lot of work involved, so a family will make an enormous batch, many of which are given to neighbors and friends. My wife’s parents owned a small bakery in Heredia, a suburb of San José. Tamales brought to them were often dinner at that time of year as they were swamped with seasonal work at the bakery. I’ve continued that tradition by bringing tamales to my neighborhood wine shop. They too are swamped this time of year and the tamales are gratefully received. Making tamales is quite an undertaking. It helps to have some like minded friends and a general to take charge. I’ve done a lot more cooking over the last ten years than my wife, but I’d say she has more the makings of a chef than I. This year, she largely demonstrated how to make the tamales for our crew and kept the process going. I worked as a prep cook for most of the day. The recipe for our tamales derives from one of Keen’s aunts, Lijia. At the heart of tamales is the masa–liquid thickened with corn flour. We use Maseca, which is corn flour with lime (calcium hydroxide, not fruit juice). The twist for Lijia’s tamales is to use boiled and mashed potatoes in the masa. You get a somewhat softer texture than using just corn flour. One cooks chicken breasts in a lot of water, add the mashed potatoes, some condimento and cilantro. Condimento is a spice blend that generally has garlic powder, cumin, and a few other spices. We make our own as it’s fresher and has less salt (or MSG) than that from the store. Plus, you can’t find Costa Rican style condimento here. My sole contribution was to upgrade the chicken and the stock. The original version called for boiling the chicken breasts for a long time to create the broth, then add everything else. There’s two problems with that approach. First off, chicken breasts don’t have a lot of flavor to add to the broth. Second, what little flavor they have is long gone once you’re done making the broth. I poach the chicken breasts and then make a stock. We start with a dozen skinless, boneless chicken breasts and four whole chickens. Remove the breasts from the whole chickens and add to the others. Rinse, pat dry, and set aside. Remove the dark meat from the bones and set aside. I freeze it and use it for other recipes, especially curries. Use a cleaver to break up the bones and expose that lovely marrow. Roast the bones along with the back and wings (also cut up into 3” chunks with a cleaver). Roast the bones for about an hour at 350 degrees. While the bones are roasting, bring a stockpot with two gallons of water up to a boil. Poach whole chicken breasts in a couple of gallons of water and set aside when nearly done. They’ll be cut up and sautéed later, so you needn’t worry about undercooking. Add the roasted bones to the poaching liquid and bring up to a simmer. Add a couple of quarts of chopped onions, celery, and carrots along with spices. This stock is a bit different from normal, so you’ll be using cilantro, cumin, and coriander. Simmer for 2 – 4 hours, strain, and set aside. As the great outdoors is an extended cooler in December, I strain everything into a big bowl, put back into the stock pot, and set outside for the night. We’re only getting started. Peel a couple pounds of carrots and slice into match sticks. Do the same for some bell peppers. These will be sautéed later and added to the tamales. Back to the chicken. Cut the chicken into half-inch pieces. Finely chop some carrots and the tops of the bell peppers. Finely mince a few cups worth of yellow onions. Heat up some oil in a frying pan, add one third of the minced veggies and onions, a couple of tablespoons and some achiote (used to color dishes in Latin America). Add the chicken breast pieces and stir fry until colored and fully cooked. Set aside and repeat. Do the same for the bell pepper and carrot match sticks. The banana leaves will need to be prepared. Slice them into roughly 9” squares. Two are needed for each tamal. Avoid Goya brand (they were surprisingly bad). We went through 20 packages of prepared banana leaves. You might guess from the scale that we make a lot of tamales. We wound up using about a gallon of homemade turkey stock to supplement the broth (making 3 gallons in total) and wound up with over 150 tamales by the time we were done. Now we make the masa. Take the chicken stock back from the porch and heat to a simmer. Add the riced potatoes and mix. Gradually add the corn flour (Maseca), and stir. You’ll want folks with some muscles and it’s going to get thick. Once it’s completely thickened (you’ll need a Latina to tell you when), take out to the table as you’re ready to make tamales. At this point, you should have a honking big stock pot full of masa. There’s a big bowl of sautéed chicken breast chunks. There’s also a couple bowls of sautéed bell pepper and carrot match sticks. You’ll also have bowls of olives, capers, and raisins (we use craisins). Think Costco sized portions. Now we’re ready to assemble the tamales. Put one banana leaf section on top of another, the smaller on top. Plop about a half cup of masa on them. Add two chunks of chicken, one on each end. Add a few match sticks of carrot and bell pepper. Put a few capers on one end, an olive or two, and some craisins. Wrap it up (you’ll need guidance) and set aside. Each pack has two tamales, set back to back and wrapped in twine. Hemp twine is in-effing-credible. Best stuff I’ve ever used. Once the tamales are wrapped and tied, they need to be cooked. Fill as many pots as you have room for with tamales on their ends. Pour water into the pot until about halfway up the tamales. If you have a pot that’s taller than the tamales, you can stack a few on top and cover them. Boil/steam for about 45 minutes. When it comes to eating the tamales, we microwave them and serve them with Salsa Lizano, a Costa Rican savory sauce. It’s the same type of sauce as Heinz 51.